The steady rise of Tesla Model 3 sales not only threatens the fortunes of Mercedes-Benz and BMW, the leaders of the US Small and Midsize luxury segment but has all the potential to completely reshape the dynamics of multiple passenger car segments, this year and beyond. Model 3 Sales in the United States has increased from 1,875 units in January to 17,800 units in August. The higher priced All-Wheel-Drive Versions out-registered cheaper Rear-Wheel-Drive version by at least seven to one. The wide price coverage of Model 3 has made the lowest priced Tesla sedan a big headache to all the players in the Small, Midsize and Large luxury Passenger car segments. Will competition upgrading existing models be enough to take on a newly launched product that is extremely different from current products? How long will the “It looks and drives so different” will last? Tesla has sold 55,882 Model 3s in the United States in 2018, delivering more than 50% of those units in the last two months. Tesla says that the company is on course to double its production during the third quarter, compared to the prior quarter. If Tesla meets its own expectation then the company will build a little more than 55,000 Model 3s during the third quarter and a major portion of those units will be delivered in the United States. 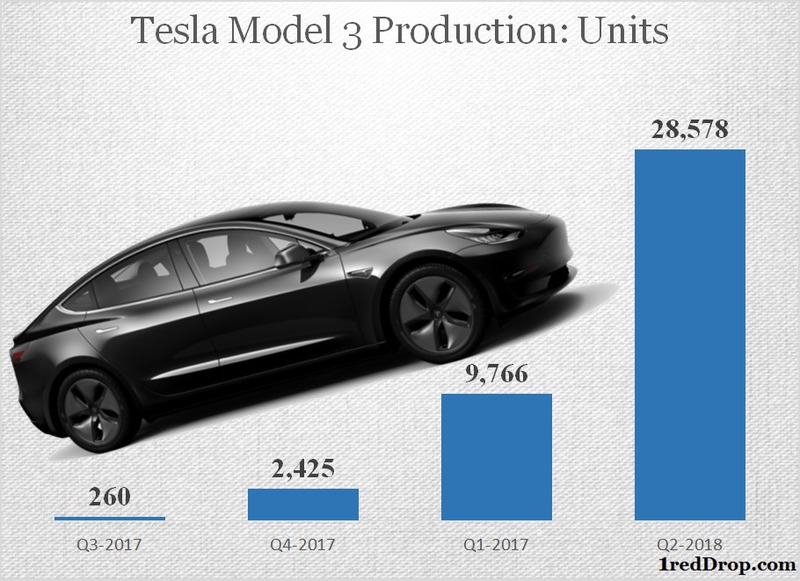 After going through a difficult production phase in the early part of this year, Tesla pulled things back during the second quarter, finishing the quarter with a high of building 5,031 Model 3s in the last seven days of June. As production accelerated, Tesla re-adjusted its delivery timeline. The rear-wheel-drive Model 3 is now available for delivery in just 4 weeks, a far cry from the 3-5 months Tesla took to deliver the model in June. Tesla has three different versions of Model 3 available for sales, Performance Version (starts at $64K), All-Wheel Drive version (starts at $54k) and the Rear-Wheel Drive version (starts at $49K). When all the options are added, the performance version costs $80,500. If we account for the $7,500 tax credit, the three available models allow Tesla to cover customers from $41,500 all the way to $73,000. The wide Price range of Model 3 pits the Model 3 against passenger cars in two segments, the US Small luxury passenger car segment as well the US Midsize luxury passenger car segment. What we found is through this year, from January to July, the top five non-Tesla cars people are trading in to get into a Model 3, they are Toyota Prius, BMW 3 Series, Honda Accord, Honda Civic and Nissan Leaf. – Robin Ren, Tesla’s head of worldwide sales. Though the top 5 trade-ins for Model 3, Toyota Prius, BMW 3 Series, Honda Accord, Honda Civic and Nissan Leaf show that Model 3 is attracting customers several segments below its price point, the primary customer pool for Model 3 will come from the US Small and Midsize customer segment that starts around $30K and goes all the way to $80K. If Tesla keeps increasing production further and manages to deliver the standard battery $35,000 Model 3, it will further expand Model 3s customer pool, directly impacting sales of segment leaders like Mercedes Benz, BMW, Audi, Lexus, Infiniti, and Lincoln. Tesla will be taking customers away from the competition because the US auto market is close to its peak sales and there is not a lot of room for the auto market to grow from here. The passenger car segment is already under intense pressure as sales declined sharply in the first half of 2018, thanks to customers shifting their loyalty to SUV over Sedans. The old guard in the luxury passenger car segment is facing a double-edged sword. A shrinking market – due to evolving customer preference on one side and a new and fast-growing competitor on the other. Will upgrading existing models be enough to take on a competitor’s product that offers a lot more than just a novelty quotient? Tesla still has hundreds of thousands of customers in the United States who have paid a deposit to reserve Model 3 and according to their CEO, the company is still collecting a healthy dose of Model 3 orders every week. It will be very difficult for existing players to do a simple model upgrade or a refresh and expect customers to not walk away to Tesla’s delivery center. They need a new product that can directly challenge the high range, high tech and EV tag of Model 3. BMW, Mercedes-Benz, and Audi are working towards launching their own EV ‘s. 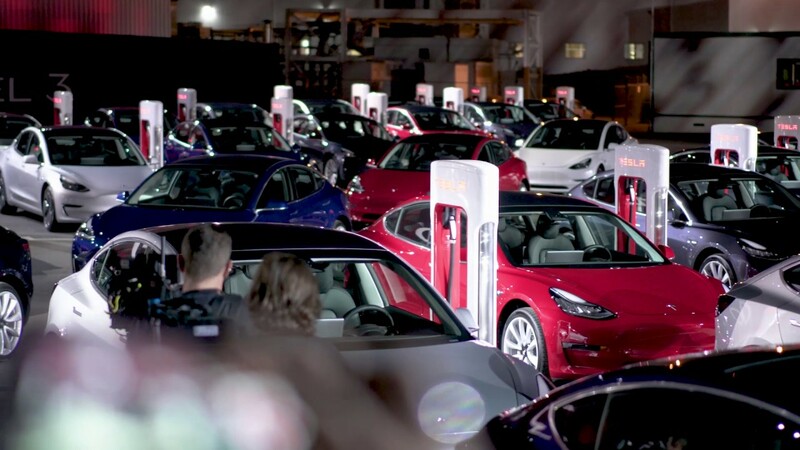 But it’s going to take a good amount of time before the cars hit the road and production will remain a critical constraint as building batteries in large scale is easier said than done, giving Tesla Model 3 sufficient time to capture market share. Competition needs new products to take on Tesla Model 3 or it risks losing market share.